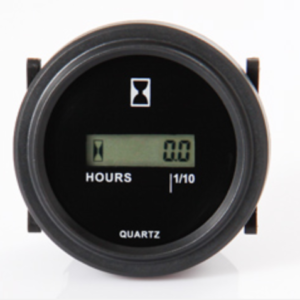 The DIN standard front dimension of 1.88" x 1.88" (48 x 48mm) makes these hour meters suitable for flush mounting and optional 2.16" x 2.16" (55 x 55mm) and 2.83" x 2.83" (72 x 72mm) bezels are available. Model DP-4AH57 is suitable for base or DIN rail mounting. The base mount is either screwed down or fitted to the rail and the meter is then clipped into it. 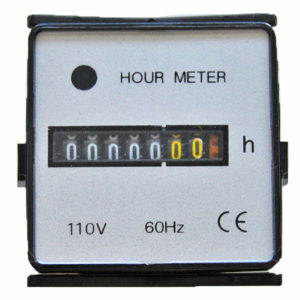 These hour meters normally display to a resolution of tenths of an hour. The AC model shows a rotating white striped wheel to indicate that it is operating. The AC unit normally operates 24, 115 and 230VAC 50Hz but other voltages and 60Hz versions are available to special order. 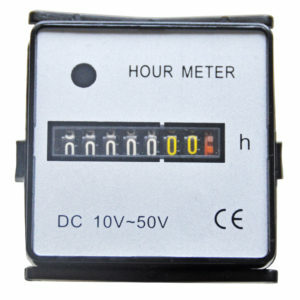 On AC models the mains supply (50 or 60Hz) is used as the frequency standard. On DC models the frequency is quartz crystal controlled. 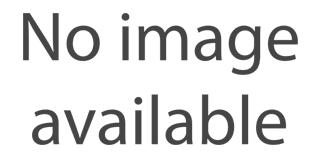 Electrical connection is via screw terminals but versions having flat 0.03" x 0.25" (0.8 x 6.3mm) pins or flying leads are also available. 2.16" x 2.16" (55 x 55mm) and 2.83" x 2.83" (72 x 72mm) bezels are available. 7 digit 4mm white on black for hours, red on black for decimal. Standard 48 x 48 DIN size. 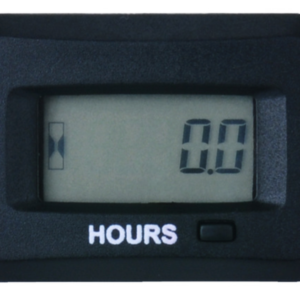 Rugged and insulated plastic case. DC or AC (50 or 60Hz). Synchronous motor drive for AC model. Quartz crystal frequency control for DC model. Extended temperature range model available to special order. Machine utilization timing for pricing, estimating etc.